Wing Chun is a martial art that originates from Southern China. Unlike other martial arts Wing Chun kung fu puts function ahead of form. Wing Chun is one of the few martial arts that hasn’t been converted into a sport or watered down into a health exercise, instead it has undergone a continuous evolution as a street practical martial art ideal for self defence. Unique in its simplicity, Wing Chun doesn’t have flashy jumping or spinning kicks, there are no complicated locks and throws and absolutely no mythical “dim mak” pressure point voodoo. Wing Chun is a martial art based upon striking, designed for fighting in close range. Designed to allow a smaller person to overcome a much larger opponent Wing Chun relies on posture to give structural strength and speed to give impact to strikes. Famous for its chain punching, Wing Chun kung fu doesn’t rely on a one hit one kill type approach that puts all of your proverbial eggs in one basket. Instead Wing Chun employs multiple rapid strikes aimed at vulnerable spots to overwhelm an opponent. Everything in Wing Chun kung fu is built upon the premise of ending the altercation as quickly as possible without endangering the Wing Chun practitioner. 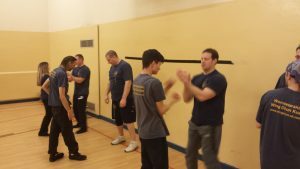 Using simultaneous attack and defence, the Wing Chun practitioner seeks to strike whilst protecting themself with the ultimate aim being to survive a self defence situation with the least harm possible.